The Samsung Galaxy Ace 2 comes with a 5MP camera and a single LED flash. It captures photos at a maximum resolution of 2560 x 1920 pixels. There's a front VGA camera for video calling too. The camera interface is the same as on previous Gingerbread Galaxy devices with two shortcut bars on each side of the viewfinder. On the right you get the still camera / camcorder switch, a virtual shutter key and the gallery shortcut. On the left there's the front-back camera toggle, the flash options and the Settings shortcut. You can add a total of four shortcuts above the Settings shortcut - any four you like in any order. The Galaxy Ace 2 has rich camera functionality - touch focus, scenes, geotagging, panoramas, smile and blink detection, effects and manual settings for things like ISO, exposure compensation and so on. The Galaxy Ace 2 produces good images overall but not quite the best in the 5 MP league. Our main issue with the results is that they came out with pretty low contrast and are a bit too soft. Still colors are nicely balanced and the detail is enough for the Ace 2 to be considered a good shooter in times of need. The Galaxy Ace 2 joins our image quality comparison tool and will face off with the likes of the Xperia U and the LG Optimus L7. The tool's page will give you all the information you'd need on what to look for. 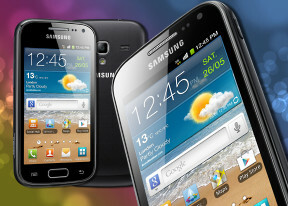 The Samsung Galaxy Ace 2 can capture 720p videos at 30 fps with its main camera and VGA videos with the secondary camera. The camcorder uses the exact same interface as the still camera. You can use effects in the videos, but there's no touch focus. Videos are recorded into MP4 files with a bitrate of 12Mbps, which is pretty good for 720p resolution. The accompanying sound uses the AAC audio codec, but is mono only (64 Kbps bitrate, 44.1 kHz sampling rate). The framerate hits the 30 fps target easily and videos are very smooth. We weren't very pleased with the video performance of the Galaxy Ace 2 - despite being smooth the videos lack contrast and the resolved detail isn't nearly as good as on some other 720p-enabled camcorders. Here's a video sample shot with the Galaxy Ace 2 that we uploaded to YouTube. And here is an untouched 720p@30fps (0:16s, 24.7MB) video sample for direct download. The Galaxy Ace 2 enters our video quality comparison tool to square off against the Xperia U and the Optimus L7, check out the results below.